The weather definitely plays a huge role in our outfit choices, especially since it can really affect our moods. I don’t hate the rain, I just prefer a warm summer rainstorm over a cold winter one. A lot of people tend to wear darker colors when the weather isn’t so lovely. That’s why I love this red coat so much. It’s such a great way to still brighten up the cloudiest of days. I paired it with a simple white top to make it stand out a little bit more and then went with dark denim. I had to wear my rain boots too, of course! These have really held up over the last 2 years or so. The print is fun to play around with and I think they worked really well with the red coat. 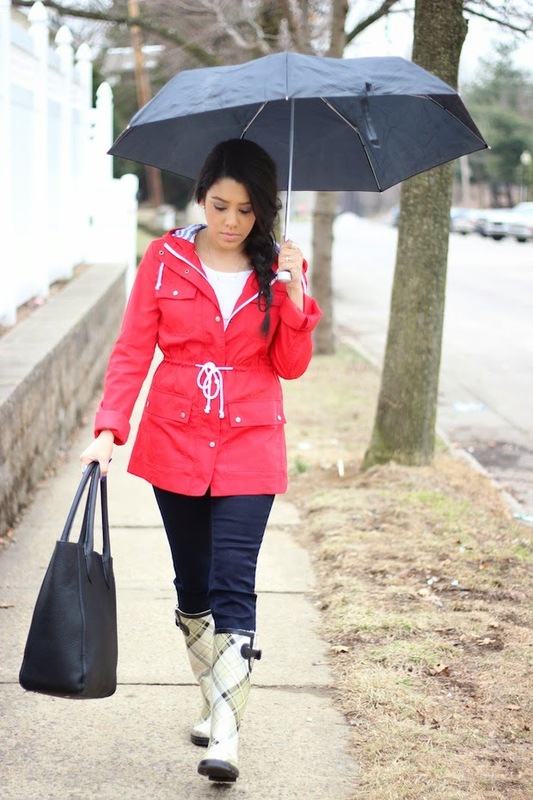 It’s just a simple look for a rainy day, but it’s still stylish. 🙂 One thing I suggest is getting a small umbrella that can fit right into your handbag. When closed, this one is super small. H&M always sells them. And last but not least, the hair. I know as women, when it rains, we sometimes don’t know what to do with our hair. 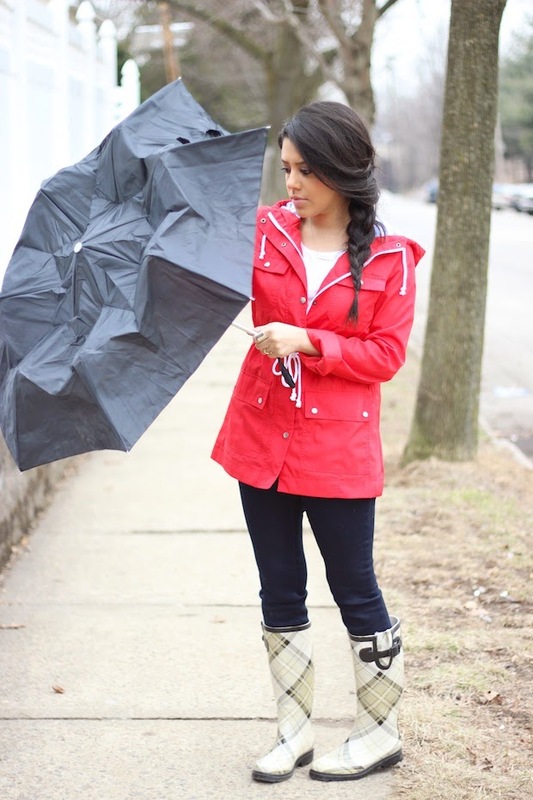 Even with using an umbrella, it can still get messed up easily from the weather. That’s why I decided to do a simple side braid. It’s cute and it won’t get ruined in the rain. Happy St. Patrick’s Day loves! I love the color of your jacket! I got a bright turquoise one, I love that mine also brightens up a rainy day! The color of your jacket makes the whole look more attractive and fun…, you look like a cute doll , side braid is perfect ,all hairstyles are just made for your hair , always suit you, you are pretty babe …. Even in a rainstorm you look adorable! 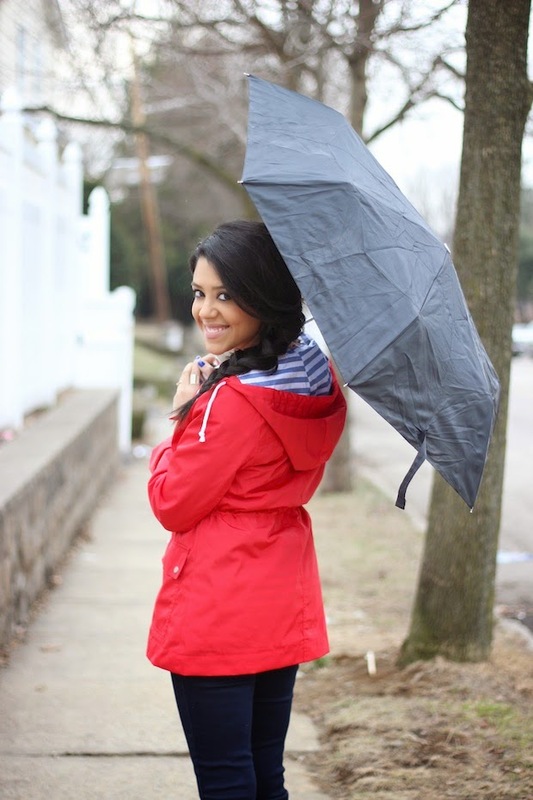 That rain coat is adorable!